Pregnancy is often associated with extended nail growth and stronger, longer nails. For some women, however, those tricky pregnancy hormones can leave her with weak and brittle nails. This effect is only temporary, but living with nails that chip and break off on a daily basis for nearly 10 months can be difficult. The first enemy of weak and brittle nails is water. Dish washing and cleaning can leave nails even more brittle than before. Wearing gloves during these chores is crucial to keeping nails healthy and strong. 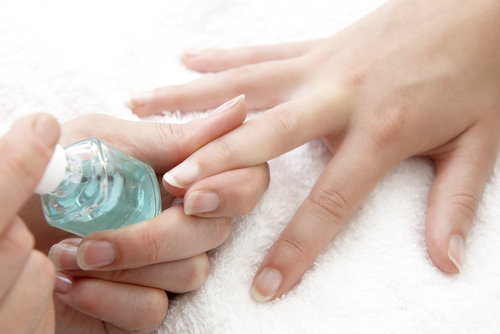 Moisturizers can also help repair nails in the same way it repairs dry skin cells. Weak and brittle nails are simply drier than strong nails, so moisturizing several times a day could make a significant difference. Women can also choose to paint their nails with clean, strengthening nail polish. This should only be done in a well-ventilated room. Manicures are also acceptable during pregnancy as long as the salon offers a well-ventilated area for mom. After birth, it typically takes three to six months for nails to return to normal. Toe nails can take nine months or more.